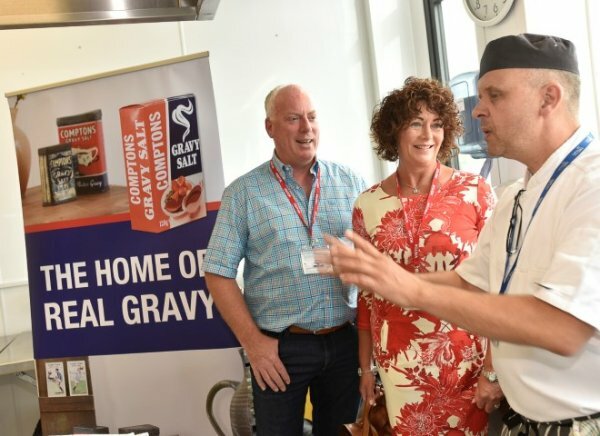 If you ask owners Wilson and Janette Deyermond, the home of real gravy is in Carlisle, Cumbria. My whole family won’t use anything else including me. I love it! Comptons Gravy Salt has been the secret to real gravy since 1925. And we’re proud that we continue to make it to the same original recipe. Our story began in Sheffield where our gravy was originally manufactured by Carter’s in the early 1920s. A series of football cards were released in 1920s and were given away free inside our special tins. The cards could be saved up and exchanged for Comptons Gravy Salt gifts such as a pocket knife, tennis ball or even a hair comb. All the items are still sought after by collectors and at auction today the cards can command a hefty £45 each. Janette and Wilson took over Comptons Gravy Salt in 2004. Carlisle born and bred, Janette has, for the last 13 years, coordinated all of the production of the Comptons Gravy Salt. And after years in the trade, Wilson knows better than anyone how to make the perfect gravy. “It is essential if you want a traditional Sunday roast. Just take the meat juice out of the tin, add hot water and put in about a teaspoon of Comptons with a little bit of cornstarch to thicken it up and you are good to go,” he said. Copyright © 2019 Teasdales Confectionary Ltd.